This is not about Who I love. This is about What I love. And I tell you – I love words, the spoken ones too, but here I speak about the written words. How used how not. The pictures they create in my mind, and the chains of thought. The craft of putting one before the other, or something amiss with the whole structure, making me frown. Thinking, could this have been better? And then re-writing the sentence, anew. Leaning back to read those words strung together again. A smile on my face reflective of a satisfied mind, or the pencil scratching my head – this doesn’t look right! Words. The games they play, and the games we play with them. And when you say ‘Ode’ on a day that stands for love, I think of 2 written long back. No, not by me, dear me! But by two poets who mastered their words – in ivory towers or sitting under trees. Even in the busiest of streets. Scribbled or typed, but always streams of thought, put in a language such that not a word I would dare change. Here’s them odes that I often go back to, and if you ask me why, I myself know not. Perhaps because these two odes rest unblemished by popularity. Also because while conventionally an Ode is supposed to be emotional and introspective, these here charm by being exactly the opposite. A few waltzing words, and the thoughts they conjure in my mind. Oh, I love! Again she stretched, again she bent. No cruel Tom nor Susan heard. Not all that glisters gold. Notice the controlled humour in this mock-epic - a composition using grand images to describe the most mundane. Also realize how the ode, an otherwise emotional piece, is actually devoid of any feelings for a dead animal. And this was supposed to be an epitaph! Look how it’s laden with moral and sexual undertones. If you can, keep aside the unflattering references to womenkind in the guise of the Narcissistic proud, gold (fish) greedy and over-reaching kitty, and see how the cat and woman blend. This masterfully written and endearing ode never fails to make me smile at my own kind. 'What female heart can gold despise?’ and yes he means to say a rich man no woman can ignore, today or back then in the London of yore. Keep those claws in, dear cats, and let us forgive him. Partly because it's a day for love, and partly because he's right! As for Fate? Are not we just playthings in the hands of our ‘Watery Gods’? Now that’s a thought to calm the mind! Our commonplace buy from the vegetable guy is celebrated in Latin America. It connotes beauty and fun and forms a meal for everybody. Yes, no elitism! A life without pretences and an ordinary that is celebration-worthy. So Neruda, including how he inscribes his geographical identity and nationality in an ode written for tomatoes! Did you feel the build-up of momentum? Like a painting being created. And the after-effect? A feeling of festivity and celebration. A poem I look at as romantic, because it makes us look at the most ordinary with such wonderment. Isn't it? What a great post for this day! Loved reading every bit of it. What a beautiful tango and waltz with words. Amazing that words can transform mundane to exotic. This was Sakshi's purist pen at its best. Happy valentines day. I have always wanted to transform the mundane to exotic, to show people the extraordinary in the ordinary that surrounds them. Either to make them laugh, or to nod their heads in agreement. How celebratory the Everyday will become then. These two above always come to mind when I sit and dream of achieving what they can. Happy Valentine's day to you too, Alka. Lots of love. What a brilliant combo of words...Gray, Neruda and you! when they claim no thought profound. Nice one, to point Cupid to not who but what you love instead. You made me a poetaster with your comment, Rickie. Well, we both tried. Wow Sakshi! I love these proses..specially Neruda! this is really a really good one. loved it.. :) thank you for providing us with these odes , varna i wouldn't have discovered how amazing can be the light side of poetry. one more thing read "i do not love you as " by Pablo Neruda ..its so simply beautiful..
And if you think again, aren't we ALL made up of words? Or lets say - words make us? I am happy for that 'connection'. Such exotic verses........Loved the prose especially Neruda!! Thanks, Red. Good to see you here! What wonderful odes! I especially loved the sardonic Gray! Poor cat, though. Thank you for reading, Dipali. Ah Neruda! I wish I had more than one pair of eyes when I read him... and an extra heart to beat to his words. You create magic- and you make it look so easy. I so so loved it. True it created a live image in my mind !! 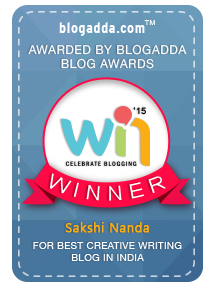 I will not say, I am impressed, Sakshi Nanda. But, it's a new genre that you scribbled and it's simply mesmerizing. I come here to improve my writing coz I enjoy stuffs you churn but I wonder whether I'll be able to hone my craft with the kind of novel things you write. Thank you, teacher. Arrey arrey, Vishal. I am really no bench mark to view your own skill against. Come here only for entertainment.